A Swedish contemporary of melodically nuanced bands like Dissection and Sacramentum, Unanimated‘s atmospheric blend of death/black metal presented newer avenues of accessibility within the underground paradigm without losing touch with the driving impulse integral to the music. Boasting its fair share of comfortable, anthemic rhythms and lead guitar spots reminiscent of a lot of old heavy metal and even Pink Floyd, Unanimated‘s achievement is to absorb these within a sinister fabric woven from equal parts Slayer, Deicide, and second wave symphonic black metal like Emperor. The advanced, well-arranged songwriting of these parts elevates this debut above the many Gothenburg-based bands that would spring up an year or so from its release. All too eagerly embracing the appearance of surface melody on display here, these bands would be found wanting, subconsciously or otherwise, of the gritty, greater-than-the-self feeling so evident here. Subtle, haunting use of keys, like keening susurrations on a still night, impart a decidedly morbid air to proceedings; these parts mostly enhance and offset the distorted fare with a cleaner, unresolved form of tension without encroaching on the main theme but sometimes venture into a leading role, creating the chief idea for an upcoming section before making a graceful exit. Unanimated resolve riffs into discrete packets, each containing an appropriate amount of development, and disperse these packets through the layout of a song. Many of these are based in the cold Dissection style where strands of steely and smartly mobile tremolo-picked notes reach out into the ether, then are punctuated with a steady power chord-rooted groove. Choppier aspects of American rhythm playing are seamlessly united with the barbarism of ancestors Dismember in a manner similar to countrymen Seance, a sign of times when various strains of extreme metal encountered easier, more amicable confluence. But tying it all together is an extroverted approach towards crafting melody typical of the European mainland. Unlike a band like Necrophobic who made similar musical overtures but always maintained a bias for the malevolent, Unanimated are guilty, at times, of placing undue emphasis on the clever hook. Subsequent course corrections prevent this tendency from detracting greatly from the overall listening experience, leaving an album comfortably nestled towards the top of the second tier of classic death metal. 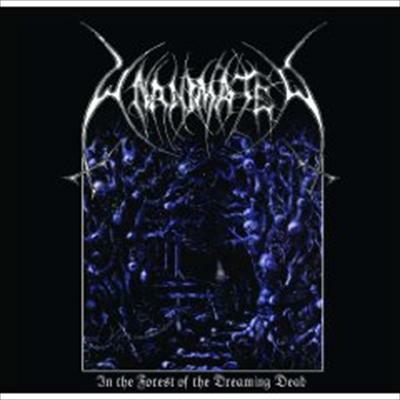 This entry was posted in Music Reviews, Retrospective, Uncategorized and tagged Black Death Metal, dissection, In The forest of The Dreaming Dead, sweden, Unanimated. Bookmark the permalink.